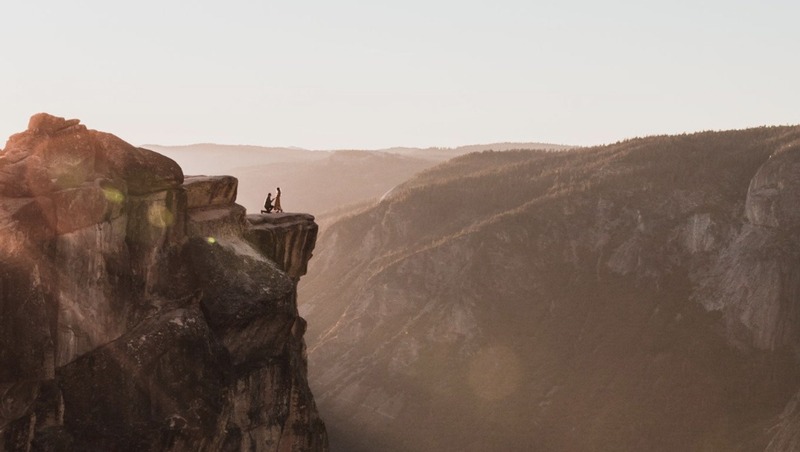 An unknown couple shared a moment of joy when one of them dropped to one knee to propose atop Taft Point in Yosemite National Park on October 6. Photographer Matthew Dippel serendipitously captured the big moment in the gloaming, and now the search is on to find the mystery couple. The viral tweet is getting picked up by local and national news media across the country, but as of this morning, the couple still had not been identified. Dippel said he was waiting for a friend to walk out onto the point so he could take a picture of him using his Canon 5D Mark III and Sigma 35mm f/1.4 Art lens, but the mystery couple arrived first. "I already had my settings ready to do a quick walk out and walk back," Dippel said. "But as I was waiting for him to walk out there, the couple walked out. Next thing you know, he's on one knee and I snapped about three shots before it was all over." Dippel quickly ran over to the area to try to find the couple, but when he arrived, they weren't among the crowd of people with whom he spoke at the popular tourist spot. "I asked about 20 to 25 people, and no one came forward, unfortunately," Dippel said. 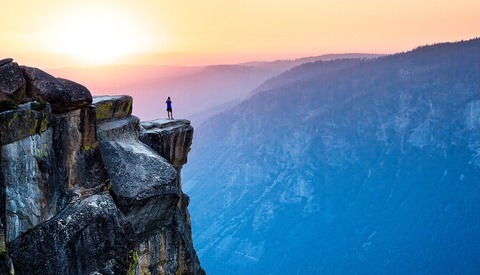 "There must have been three or four bride and groom couples shoots at the time at Taft Point, with at least 10 photographers around, so I wouldn't be surprised if someone else has a photo of the couple, just not from the perspective I was at." 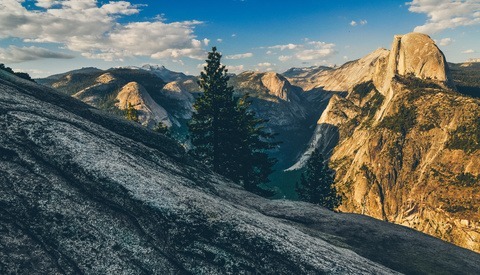 Do you know anyone who recently got engaged at Yosemite? You might want to share this tweet with them. Drop a comment below and let us know what you think of Dippel's fortunate photograph. i cant imagine a couple that would be pissed of about recieving this beautfull imagine, even if it was in twittter for the world. you cant even see their faces. I doubt they would be. It's just a possibility. My point is, take the photo absolutely but try to find a less conspicuous way to find them. What? Are you mad? Twitter is the absolute best way to find them. The couple will be completely stoked when they receive the photo and the excitement in which this search via Twitter has provided is nothing short of priceless! Lay off the negativity pills will you, Sam. They might even be dead and their grieving survivors might not like the photographer amplifying all of the sad feelings the've been dealing with. They could be Russian spies who don't want their cover blown! Or ghosts! Cameras are supposed to be able to see ghosts. Oooo spooky! Perfect for Halloween! Ask charltonchurchill on Instagram. He is the one who set the shot up. No he did not. Charleton Churchill has commented on his own instagram post saying that it was not this couple. Charleton Churchill also says that the couple he was photographing did not propose to each other. Don’t let synicism ruin your life, Mr Blonde. Reminds me some other photographer who photographed “wrong couple” and then was searching for them an all photographic communities, and one couple which Instagram was mysteriously copied by othet couple down to location and props, and then it was discovered that they are friends and travelled together. So, may be that’s just good SEO technique? That's one of the possibilities I thought about. There were three or four other bride and groom couples there? I don't love that. Just saw this on CNN today. HOPEFULLY with all the exposure, Matthew will ind the couple! I'm a naturally skeptic person, so I would not be surprised at all if this was an elaborate marketing scheme. If so, damn good idea! It’s possible, but highly unlikely. I’ve been a journalist in varying roles since 2001 and I’d like to think I’ve gotten pretty good at being able to tell when someone is trying to pull one over on me. I think Dippel is on the level. Also, since he’s from Michigan, it seems unlikely that he traveled all that way to perpetrate a marketing hoax. No matter, though, it’s a fantastic photograph he can be proud of.